Life with Lesley: Another Valentine's Day Giveaway...by Dixie Cajuns' Creations! Another Valentine's Day Giveaway...by Dixie Cajuns' Creations! Yep, that's right another Valentine's Day Giveaway!! I am so happy to be able to offer this one to you all. Dixie Cajuns' Creations is a fairly new site to get adorable handmade aprons and dolls. It's owned and operated by Mrs. Josephine Lirette, who is just the sweetest lady you could ever meet. 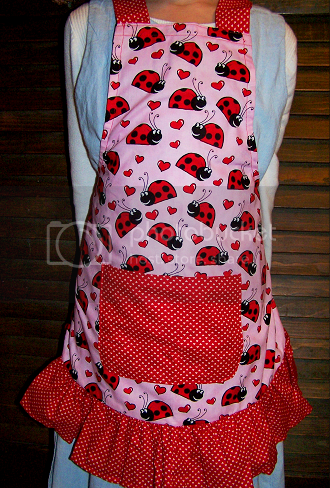 Dixie Cajuns' Creations carries aprons for both mothers and daughters and they are just the best. Also you can purchase dolls that wear similar fabrics. I am so in love with this stuff! 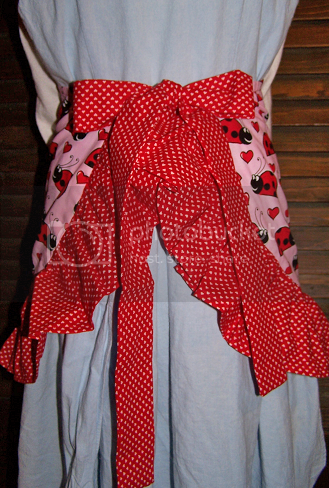 Mrs. Lirette has offered up a daughter's apron called Little Alice to ONE lucky reader. The winner will get to choose what size; Small (3-4), Medium (5-6), or Large (7-8). To enter to win, go to Dixie Cajuns' Creations and tell me what you like from the store. For additional entries you can do the following. Just remember to leave a comment for each one. i love the hannah apron becuz i have a hannah! I also love the Marie mother's apron! The Alice is actually my favorite!!! I love ladybugs! I follow Dixie's Cajun Creations on Facebook. I follow Dragonflies 'n Dreams on Facebook. I am subscribed to receive updates. I love the Marie and the Hannah aprons! Please enter me. ;) Mrs. Lirette is a wonderful lady! I think my daughter would love the Alice Apron, but we also like the Hannah! We [url=http://www.casinobonus.gd]online baccarat[/url] be suffering with a large library of unqualifiedly unconditional casino games championing you to play right here in your browser. Whether you appetite to unaccustomed a provender recreation scenario or just examine manifest a few late slots in the presence of playing in the direction of real filthy lucre, we have you covered. These are the rigid uniform games that you can treat cavalierly at true online casinos and you can with them all in requital for free.